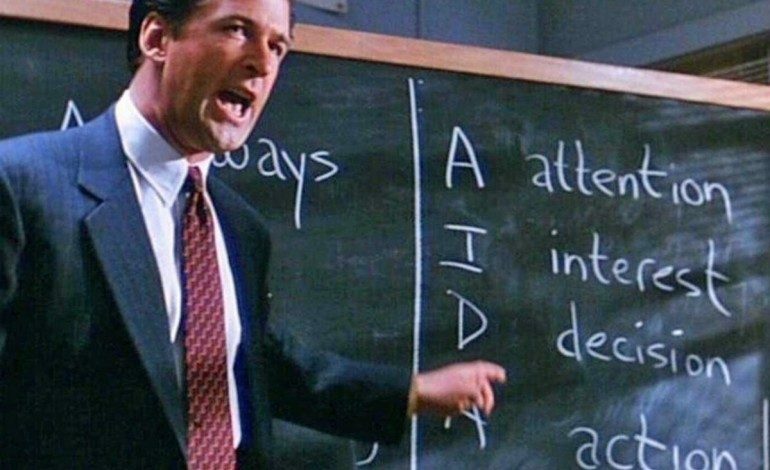 Salesmen are Under the Gun as ‘Glengarry Glen Ross’ Turns 25! I am not a salesman. I do not knock on people’s doors nor do I enjoy people knocking on mine. I often wonder what goes through a salesman’s mind when he’s approaching a potential client’s house. Ever since listening to the advertising monologue from George Carlin, the idea of sales interested me in not working for them, but understanding who they are and how they go about their lives. In Glengarry Glen Ross we are introduced to a group of salesmen who are under pressure from the downtown office to “get their act together” or they will be fired. Based on the play of the same name that was written by David Mamet, (who also penned the screenplay for the film) Glengarry Glen Ross is such an intense experience that wound me up like a clock, and by the end of the film, I was in a state of euphoria. Featuring a stellar cast which includes Jack Lemmon (Grumpy Old Men), Al Pacino (Scent of a Woman), Alec Baldwin (The Hunt for Red October), Ed Harris (The Abyss), Alan Arkin (Edward Scissorhands) and Kevin Spacey (The Usual Suspects) who all give powerhouse performances. Things become tense when Blake (Baldwin) comes in from downtown to give a pep-talk to the salesmen of Premiere Properties. The leads (or potential buyers) are weak and are either not interested in investing money on land or simply don’t have the money and the salesmen aren’t closing any deals. The talk that Blake gives to the salesmen is cruel, full of language and I suppose is to scare the men into working harder to secure their employment. And just for a laugh, the two top sellers will get a gift, one will get a Cadillac and the other gets a set of steak knives. The remainder of the salesmen will be fired. But there is a catch. The leads that these salesmen have been talking to, trying their best to sell them land, are essentially worthless. Whoever still has their jobs will receive access to the Glengarry leads, buyers who are interested in investing and have the funds to do so. The title of the film relates to two real estate developments that are being pushed by the salesmen: Glengarry Highlands and Glen Ross Farms. So, we now know the situation that is at hand. As the story unfolds, the salesmen take center stage. Each salesman has their own story and are given the appropriate screen time so that we can understand each one. It’s best for you to experience their story for yourself so I’ll only mention two of them. We have Shelley “The Machine” Levene (Lemmon) a down on his luck salesman who has seen better days. His daughter is in the hospital and he’s in desperate need of a sale. We also have Ricky Roma (Pacino) the top salesman of Premiere Properties who discusses a property with a client over dinner. He delivers quite a speech on how to sell to his client. Here’s what I love about this story. It’s all about the characters. We see how each of them deal with their lives and the situation that they have been put into. There’s a great moment when Levene visits a client who is clearly not interested in anything that he is selling and the look of despair is heart-wrenching to say the least. I never thought of how I was going to be pulled into this film as I got to experience how these salesmen operate. They lie, cheat, steal, intimidate and use bribery just to benefit themselves. There’s also another scene when a client visits the office and Roma does his best to distract his client by talking to another salesman who’s pretending to be a client. The only thing that I would’ve wanted to see was the actual stage play itself when it made its debut in London in 1983 and went on to win the Pulitzer Prize a year later. As a film, Glengarry Glen Ross is an intense ride, but also a great character study. Even though the story itself is fictional, the story draws inspiration from when David Mamet worked in a similar office. The writing is very well done, feeling all too real on how a salesman will do his best to reel you into giving away money. The entire cast give Oscar-worthy performances. Jack Lemmon was awarded the Volpi Cup and Al Pacino was nominated for an Academy Award and a Golden Globe for his performance. In truth, no actor can be singled out because everyone is at the top of their game.